Social Media is about building a conversation with your consumers. It’s a great way to interact, promote, and connect with clients and prospects. 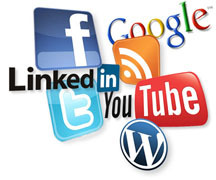 Within Facebook, Twitter, YouTube and LinkedIn we work to create a presence for you that will engage your audience. Successfully using social media to drive sales, build traffic, and create a more personal relationship. We help you connect with your audience, and then focus on building and sustaining the relationship between your company and your expanding audience. Contact us today for more information on Social Media Marketing!